Dr. Ella Ahearn was exposed to the medical field early on—her father was an orthopedic surgeon, and her mother was a nurse. Having grown up with everything from dogs, cats, and ponies to goats, rabbits, and ducks, Dr. Ahearn decided that the best way to combine her adoration of animals with her interests in the medical world was by becoming a veterinary professional! Thanks to her father’s years in the Army, Dr. Ahearn lived in various states growing up and eventually settled in the South Carolina and Georgia area. She attended Clemson University, where she was first exposed to large-animal husbandry to balance her small-animal care experience. 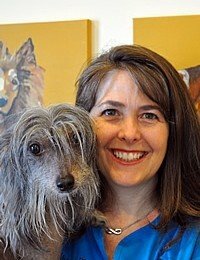 She received her veterinary degree from the University of Georgia, concentrating in companion animal medicine. This sparked a veterinary career that has lasted more than 20 years—to this day, Dr. Ahearn loves what she does just as much as the day she started! Dr. Ahearn purchased half of the Animal Hospital of Sandy Springs in January of 2002, and has happily been practicing here ever since. She has particular medical interests in wellness care, preventative medicine, and dentistry work. Dr. Ahearn is also fond of geriatric pet care, largely because of her own aging four-legged friends’ needs. At home, Dr. Ahearn, her husband, and their two children share their lives with a Chinese Crested dog named Violet, a Belgian Malinois who goes by Amess, and a pair of felines named Maui Jim and Traveller. When she’s not spending time with her family or caring for the area’s pets here at the hospital, Dr. Ahearn enjoys volunteering at her kids’ school, knitting, cooking, hiking, and reading a good book.